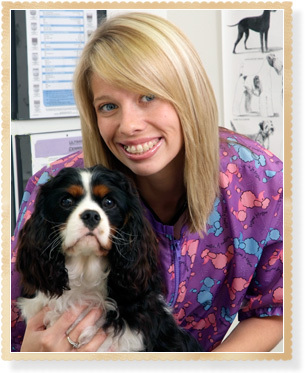 Melissa Seavolt has been a registered veterinary technician at The Yancey Clinic of Veterinary Medicine since 2005. "I love working at this clinic because my skills are used to the fullest," she said. "Knowing at the end of the day that I made a difference — either with a client or their pet — is a great feeling." Melissa earned her associate's degree of Applied Science in Veterinary Technology from Columbus State Community College. She is a member of the National Association of Veterinary Technicians. Prior to joining the clinic, she volunteered at the Ohio Wildlife Center, where she helped administer medications and care for sick and injured animals. When not at the clinic, Melissa can be found spending time with her husband, two daughters, and friends. She also enjoys running and time outdoors. At home, she cares for four pets: two dogs, Jake (Shepherd mix) and Hana (beagle/Labrador mix), and two cats, Isabelle and Ruby. 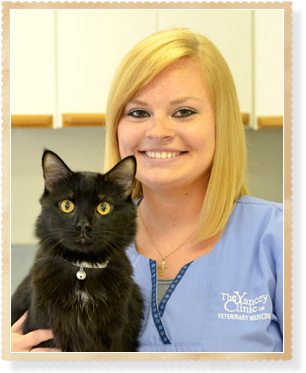 Ashlee Townsend joined The Yancey Clinic of Veterinary Medicine in May 2013 as a veterinary technician. "Ever since I was a little kid, I have always wanted to help animals," she said. "Now having the opportunity to work hands on, helping them and giving them the care that they need is such an amazing feeling." Ashlee has eight pets: three dogs, Bidwell (beagle), Briste (Entlebucher Mountain Dog), and Mayla (mixed breed), three cats, Lola (Bengal leopard cat), Luda (Bengal leopard cat), and Dundee (domestic shorthair), two outdoor cats, Beggin and Barnee. When not at work, Ashlee loves spending time with her husband and their pets, family, and friends. Her hobbies include gardening, exercising, shopping, and scrapbooking. 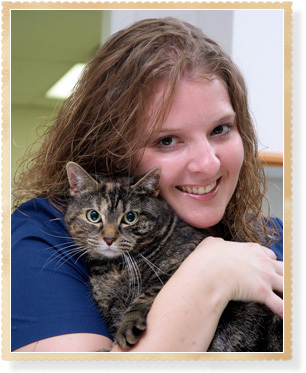 Katie Owen joined The Yancey Clinic of Veterinary Medicine in September 2013 as a registered veterinary technician. She earned her Associates Degree at the Vet Tech Institute at Bradford School in Columbus, OH. "I love working here because of the variety of challenges we face every day," she said. "Being able to work with the patients and their owners is such a rewarding feeling." Katie has four pets of her own: two cats named Moglee and Sophie, a Border Collie mix named Holly, and a Chihuahua named Zoe. She enjoys spending her free time with her family, friends, and pets and her hobbies include photography, scrapbooking, baking, and reading. 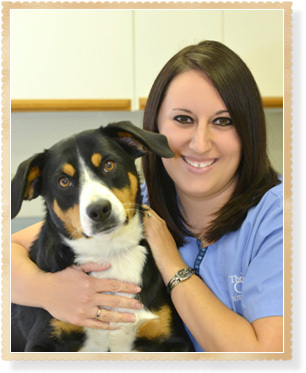 Summer Sansotta has cared for pets as a veterinary assistant and pet stylist at The Yancey Clinic of Veterinary Medicine since 2007. Helping pets has long been her passion and she enjoys working with the animals that come into the hospital each day. "I love my job," she said. "I find it very personally rewarding because I love helping animals and developing relationships with the pets' parents." In her free time, Summer is very active in her church. She also enjoys being outdoors, horseback riding, fishing, hiking, exercising, crafting, and spending time with family and friends. She has two pets: Finn, a cat, and Jake, a miniature Australian Shepherd. 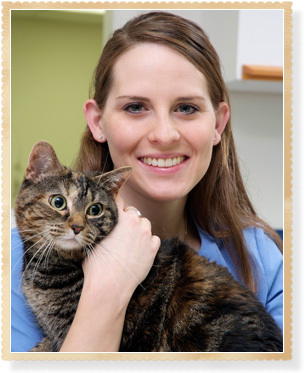 Veterinary assistant Courtney Hans joined The Yancey Clinic of Veterinary Medicine staff in 2005. She enjoys working first-hand with pets and clients and loves knowing that she has helped make a difference in a pet's life. Her animal companions include two German Shepards, Charm and Mya, and a cat named Maddie Lynn. In her spare time, she can be found shopping, camping, and visiting with family and friends. She also enjoys listening to music and attending the theatre. 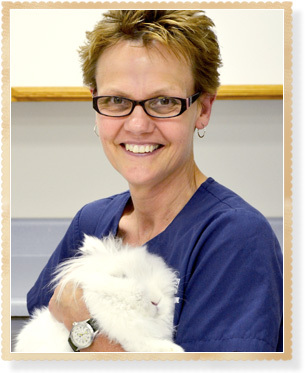 Receptionist Sandy Glimpse joined The Yancey Clinic of Veterinary Medicine in April of 2011. "I love dogs. I enjoy seeing the interactions between owners and pets. Every day is a different experience, an opportunity to learn something new," she said about why she loves to come to work every day. Sandy has two children and in her free time enjoys biking, weight training, and walking with her dog Buddy. Sandy also loves to sew, paint, and make crafts. She shares her home with Skippy, a cockatiel, and she has taught Skippy to whistle part of The Three Stooges theme song!